The turtle trading system is an interesting idea to explore both for the trend follower and for the breakout trader. The basic aim of “the turtle” is to enter trends at the early stages – it uses range breakouts to time these entries. The importance of early entry is that the first stages of a trend are often where momentum is strongest and where the most money is made. The “turtle traders” were for all intents and purposes the forerunners of our modern day trading robots. They were people with little or no trading experience who were given a precise set of rules to try to beat the markets. In this post we’ll look at a simplified example of how the turtles timed their entry into a trend and then would track that trend as it advanced. 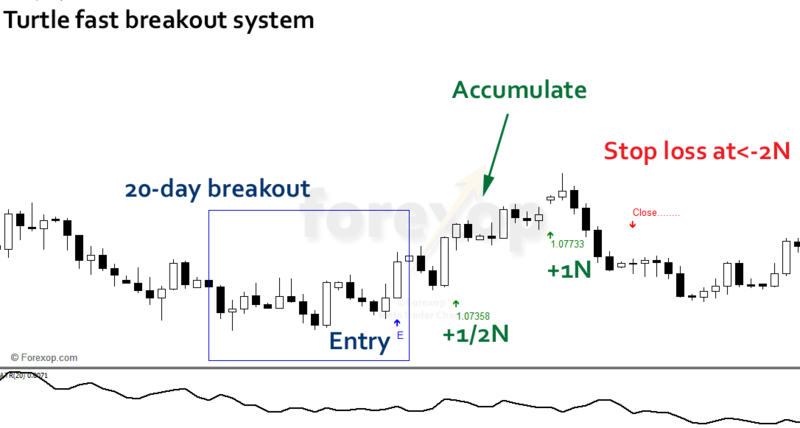 The turtle trading strategy uses a dual breakout system to enter the market. 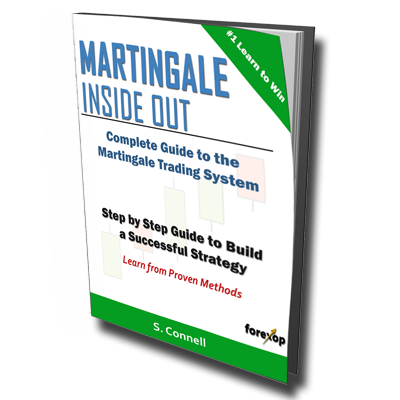 The idea behind this is to identify and profit from newly developing trends. The two systems work together and complement one another. New trends often get underway after a breakout of some kind. A breakout is simply where the price starts to move strongly in a new direction, moving outside of an established range, and breaking new highs or new lows. That’s the time a breakout trader wants to enter into the market. However the fact is that most breakouts don’t grow into trends that are big enough for profits to be made. The turtle’s fast breakout is designed to enter trends early on. It aims to build the position at the earliest stages, as a new trend is just forming. On the other hand the turtle’s slow breakout system works on a longer time frame and requires a stronger indication of a trend’s existence. The purpose of this is to enter trends that are more established than would be indicated by those on a shorter time frame. The slow breakout signal also allows for greater retracements of the trend than the fast breakout system does. This allows it to stay in strong trends, for longer. An example of a 20-day breakout is shown in Figure 1. The turtle system triggers a buy entry which is marked on the chart with a blue rectangle. The trigger happens because the price breaks out of a 20-day range and makes a new high. This happens at the candle marked with the blue arrow. Following on the trend rises further and at the green arrow the first accumulate signal is triggered. The original turtle system accumulates (adding units) as the price moves up in steps of a distance 1/2 N where N is the average daily movement of the market (see here for an explanation). That means at ½ N, 1xN, 1.5xN and so forth. At the first green arrow in Figure 1 the move between the entry price and the current price is more than ½ xN. This triggers another buy order. Another accumulate signal is triggered at 1xN because the price continues to rise in the direction of profit. At this point the total size of the position is 3 units and the average entry price is 1.0773. After the third unit is added, the trend starts to pull down again. Notice that no further units are added so the position size doesn’t change. The average price paid for the 3 units is 1.0773. On the candle marked with the red close arrow the price descends to 1.0703. The value of N at this point is 65 pips so this triggers a stop loss because the price is now more than 2xN (130 pips) below the last entry price of 1.0838. Using trailing stops: The turtles used trailing stops whenever adding units to a position. This had two effects. The first was to lock in profits on earlier trades and the second was to limit downside risks on later ones. The stops for all units would typically be placed at 2xN from the last entry price where the order was filled. So for example if the last position was filled at price 1.0838 and N=65 pips, this means the stops for the units added earlier would all be raised to 1.0838-2xN or 1.0708. According to the turtle rules, a 20-day breakout is only traded on when the previous breakout failed. Therefore, since this one ended with a stop loss, this next breakout would be traded rather than skipped. The slow breakouts are similar to the fast breakouts but are triggered when longer and more substantial trends might be starting. The price must breakout of its 55-day’s range and that triggers a buy order or a sell order depending on whether a high or a low is reached respectively. Unlike the fast breakouts, the 55-day breakouts are traded on every signal. The 20-day breakout on the other hand will only trigger if the previous one failed as was the case above. The chart in Figure 2 shows an example 55-day breakout. To start the position we buy 1 unit at 1.0917. As before the units held are accumulated each time the trend rises by a distance of 1/2xN at that point. Keep in mind that N can change over time. So for example at 1.0986 another 1 unit is added to the position. This brings the total to 2 units with an average entry price of 1.0952. The position is built-up gradually in this way as the trend progresses further in the direction of profit. If we stick strictly to the turtle’s rules on diversification then the maximum number of units should only be 4 because this is a bet on a single market. So that would be the maximum position size we can have. The profit is taken when a trend reversal signal arises. The rules the turtles originally followed is that the price must touch a 20-day low after a 55-day breakout. on the 4 units held. The turtle is not a quick win strategy. It’s one that has to be followed for a few months at least before seeing the benefits. That’s because it produces lots of small losses with a few big gains. To be profitable those big wins have to be sizeable enough to compensate for the losses. This high failure rate means the turtle trader has to rely on a few tricks to increase the chances of getting in at the right time. The turtle also relies on strong risk management and that’s an integral part of the whole strategy.